Pokémon Platinum (ポケットモンスタープラチナ, Poketto Monsutā Purachina?, Pocket Monsters Platinum in Japan) is a title in the Pokémon series. It is an enhanced remake of Pokémon Diamond and Pearl, following the same patterns as Pokémon Yellow, Crystal, and Emerald. 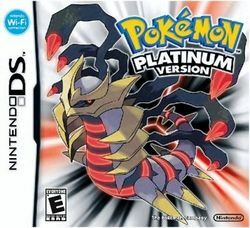 In May 2008, Pokémon Platinum was announced on the official Pokémon website to be slated for an autumn 2008 release in Japan and was released on May 22, 2009 in the UK. The game features Giratina as its mascot. When Cyrus summons both Palkia and Dialga, Giratina emerges from a shadowy blob to stop his conquest. It can revert into its Origin Forme (オリジンフォルム, Orijin Forumu?). This page was last edited on 23 August 2015, at 23:27. This page has been accessed 143,904 times.